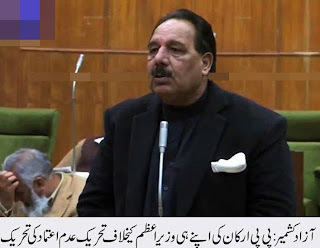 Muzaffarabad, July 22nd 2013: A no confidence resolution against Prime Minister Chaudhry Abdul Majeed was submitted in the Pakistan administered Kashmir (PaK) Legislative Assembly secretariat by two ruling Peoples Party (PP-PaK) dissidents here on Monday. In order to fulfill a constitutional requirement, the resolution proposed the name of Barrister Sultan Mahmood a top PP-PaK leader who had held this office from 1996 to 2001 - as successor of the incumbent premier. The no confidence move, which comes exactly two years after the installation of Majeed led government, was reminiscent of three such successful moves between 2009 and 2010, which had generated critical opprobrium for the previous assembly. “Prime Minister Chaudhry Abdul Majeed has caused irreparable harm to Kashmir freedom movement, identity of the state, governance and developmental activities besides violating merit, ruining institutions, unlawfully distributing development funds and inducting favourites, instead of eligible persons in the Public Service Commission,” read an excerpt from the resolution, submitted by minister for rehabilitation Abdul Majid Khan and MLA Muhammad Hussain Sargala.